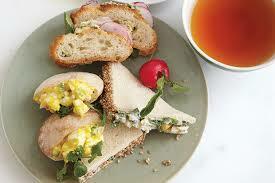 These three recipes will make the most adorable, and yummy, sandwiches for your tea service. They are just as good if you “up-size” them to a regular sandwich for lunch in stead. If you’re expecting a large crowd, you can easily double the recipes. * Click here to learn how to clean these ingredients. ** Click here to learn how to make the perfect hard boiled egg. Whisk mayonnaise, scallion, shallot, apple cider vinegar, mustard, curry powder, and cumin in a large bowl. Fold in eggs and apple. Season with kosher salt and freshly ground pepper. Fill pita pockets with about 1 tablespoon egg salad each. Top pita sandwiches with arugula leaves. Whisk yogourt and vegetable oil in a medium bowl. Stir in cilantro/parsley and mint, kosher salt, red pepper flakes, and black pepper. Fold in crab meat and mango. Thinly spread yogourt on one side of each slice of bread. Divide crab mixture among 8 slices; top with remaining bread, yogourt side down. Trim crusts. Cut each sandwich in half on a diagonal. Place toasted sesame seeds on a plate, if desired. Dip one cut side of each sandwich in sesame seeds. ** Click here for tips on zesting. Mix first seven ingredients in a small bowl. Season with sea salt and pepper. Spread herb butter on one side of each slice of baguette. Toss radishes with salt and pepper in a medium bowl. Top half of bread slices with radish leaves and radish slices. Top with remaining bread slices, butter side down. This marinade/rub will give your meat a bit of a Latino kick! You can cut down on the amount of jalapenos you use if you want it to be milder, however when the jalapenos are charred they tend to lose a bit of their potency. Additionally, if you remove the seeds and inner membranes (the white parts that the seeds cling to) from the peppers, that will greatly reduce the heat level. This recipe will make about 2 cups of marinade. * Click here for tips on zesting limes. ** Click here to learn how to properly clean lemon verbena. *** Click here to see the approved kosher alcohol list. Preheat your grill or grill pan. Place the jalapenos on the grill and cook, turning occasionally, until charred black. Allow jalapenos to cool. Once cooled, remove the stem and seeds. Combine the seeded and stemmed jalapenos and remaining ingredients in a food processor. Using the pulse control, process until almost smooth and combined. Rub steaks (or other protein) about one hour before grilling, using only enough to coat the steak. This recipe should be enough for about 4 steaks. This is a great side dish to serve with your Indian meal! This recipe makes 6 servings. Warm oil in a large skillet over medium heat. Stir in potatoes, cauliflower, onion, and garlic; cook until the garlic begins to brown. Stir in the curry powder and ginger, and cook about 3 minutes. Stir in lentils, tomatoes, vegetable stock, vinegar, and chutney. Season with salt and pepper. Cover, and simmer, stirring occasionally, until the lentils are tender, about 20 minutes. Top with parsley. ᶲ Click here to see COR’s policy on the use of cauliflower. * Click here to see how to clean fresh parsley.